APS Bank, one of the leading banking institutions in Malta, has partnered with NF Innova to implement omni-channel digital platform for both its retail and corporate clients. The implementation of the solution is expected in first half of 2019. APS Bank was established in 1910 as a savings bank. Over the years, the Bank has evolved and developed as a leading provider of financial services ranging from personal to business to investments. Its retail and commercial distribution channels consist of a network of branches and ATMs across the Maltese Islands complemented by an online banking platform. Wealth management services are also offered through the APS Bank subsidiary companies. For over 100 years, APS Bank has been a trusted partner to its clients assisting with both their economic and social development. As much as its ethical values are rooted in the traditional model of a service-orientated bank, they are equally reflected in its modern commitment towards sustainable financing practices. NF Innova is a member of the New Frontier Group, leading digital consulting and digital solutions company in Central & Eastern Europe. With their iBanking Mobile Solution, New Frontier Group is recognized as a forerunner among leading Fintech industries in IDC MarketScape 2017. The sole focus of NF Innova is the creation of the state-of-the-art Digital BankingSolution. Intelligently structured opti-channel digital banking platform with smart digital layer and powerful segmentation, allows financial institutions to fully digitize and automate their customer facing processes. At the same time, it ensures completely personalized real-time services with immediate execution, and easy onboarding across any digital channel. Delivering personalized and timely information to clients, while at the same time, offering ways of operating their accounts, is today’s imperative in the banking industry. APS Bank has therefore decided to partner with NF Innova – to make this available through its digital channels (internet and mobile banking), to both its retail and corporate clients. Implementing this solution requires connecting to the core system, and the bank’s employees are able to use the administration panel (admin panel) to administrate all front-end channels, including layout and applications design, as well as to create client segments (groups of users), and to perform other administration-related activities. NF Innova has provided a platform that can serve all client groups. This enables lean implementation and fast time to market, at the same time making the future management of customer channels much more convenient. The subject of this cooperation is the implementation of an omni-channel banking platform that includes internet banking module and mobile banking. Some of the features that the solution brings are mobile onboarding, segmentation and various native applications. “Keeping pace with today’s consumer expectations can be a daunting thought for most traditional banks. It requires strategic decision-making because it involves the transformation of banking as we know it and as it has been practiced by most banks. Our aim is to encourage such transformation by providing the right solution and expert support. The solution that NF Innova has developed can satisfy all modern business requirements, offering a single platform that can accommodate both business and private clients. Mobile onboarding, channel hopping, the iBanking solution is all in one place for more convenient banking,” says Aleksandar Lenov, Sales Executive at NF Innova. “NF Innova provided a platform which is integrated, scalable and futureproof, allowing the Bank to provide an omni-channel experience across various devices. 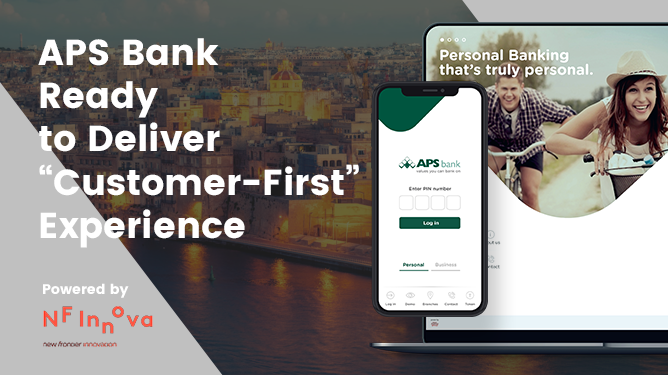 The platform should serve as the foundation allowing further incremental developments with the ultimate goal to make the customer experience simpler like never before.” commented Jonathan Caruana, Chief Technology Officer at APS Bank.